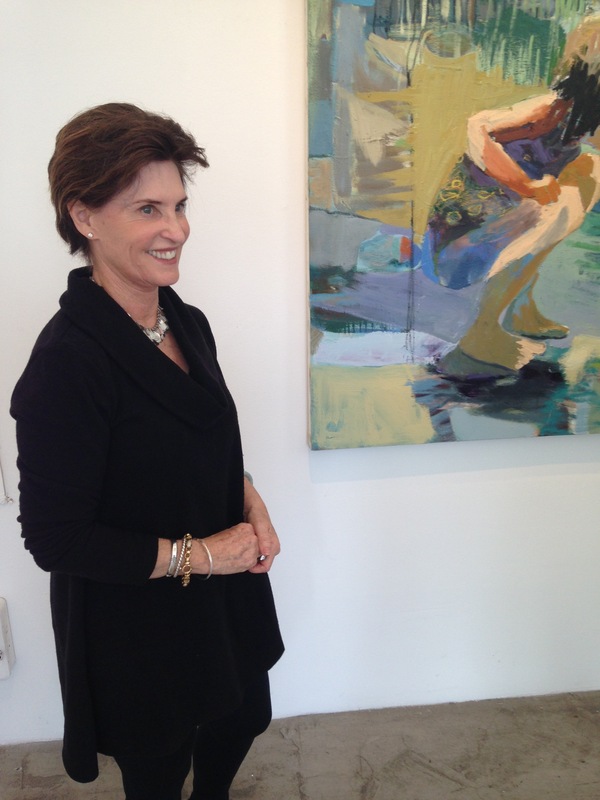 At Sue Greenwood Fine Art in Laguna Beach, painter Linda Christensen is showing a suite of recent oil paintings. Responding, over time, to the example of Bay Area Figurative painter David Park (1911-1960) Christensen paints figures in a broad, improvisational style. Working occasionally from photos but more often from memory, Christensen has an interest in in body language and in its narrative suggestions. Linda Christensen, Ritual, Oil on canvas, 36 x 36 in. Christensen's painting Ritual, which features a female figure leaning over an aqua oval table, has hints of cubist distortion and an energetic interplay of patterns and linear elements. 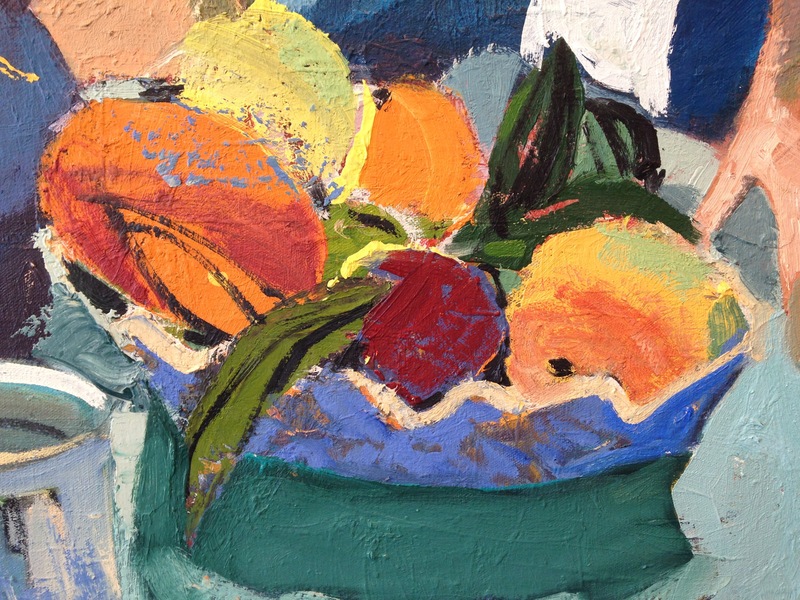 The artist's responsive brushwork creates an atmosphere of freshness by letting traces of earlier layers peek through areas of dry brushwork and edges. The interplay of figures, including a cluster of women in the background, hints at social exclusion and possibly gossip. 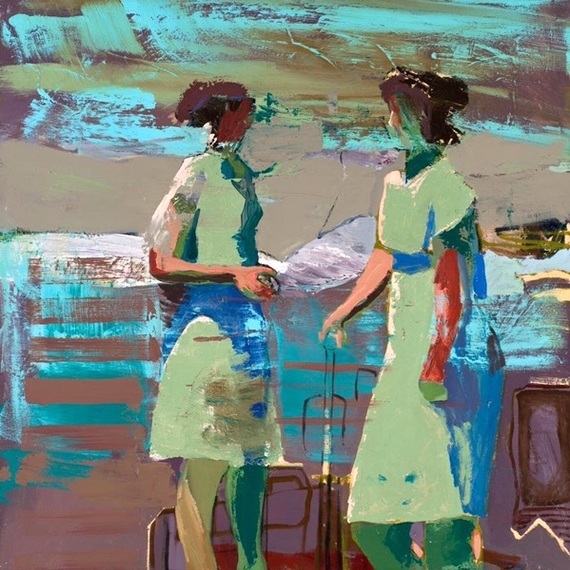 Linda Christensen, Fundamental, Oil on canvas, 36 x 36 in. 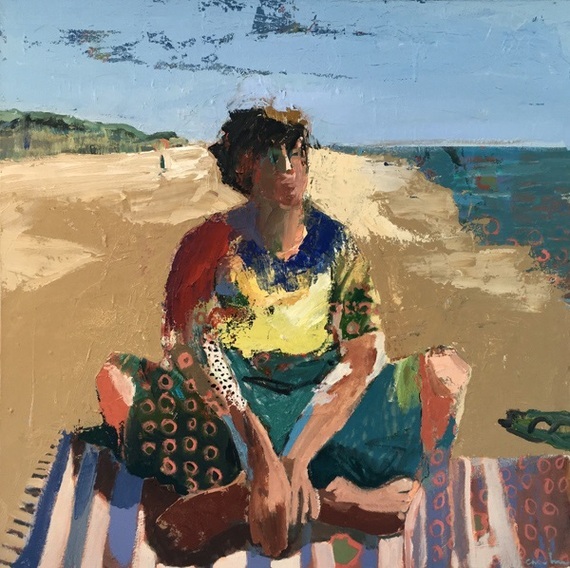 Fundamental employs a female figure seated on a striped rug at the beach. Christensen lets the scraped geometries of the landscape "lock" the figure into place, and then cuts loose with a series of improvisations across the figure's limbs and clothing. Flat, unmodified patches of risky color and unexpected patterns make Christensen's willingness to push her imagery to the edge of quirk and beyond readily apparent. 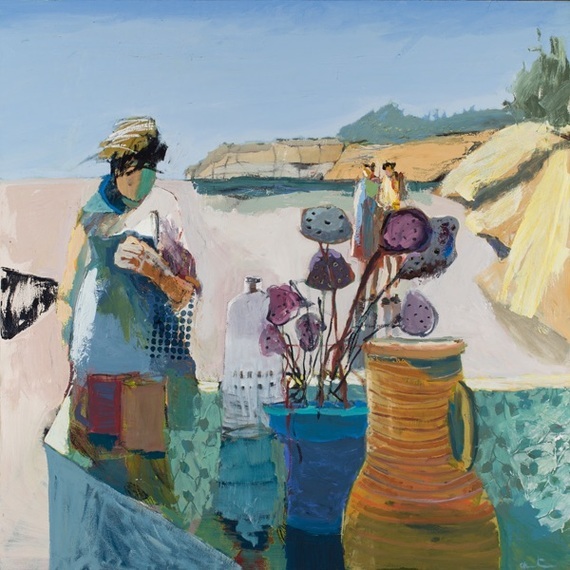 Linda Christensen, Game, Oil on canvas, 40 x 40 in. Another canvas, Game, showcases a kind of face-off between two faceless figures in an abstract zone. In the image's refusal to become portraiture, while instead relying on body language, there is a kind of metaphor present. Christensen enjoys creating narratives that balance the tightrope between obscuring and revealing, both in symbolic and visual terms. 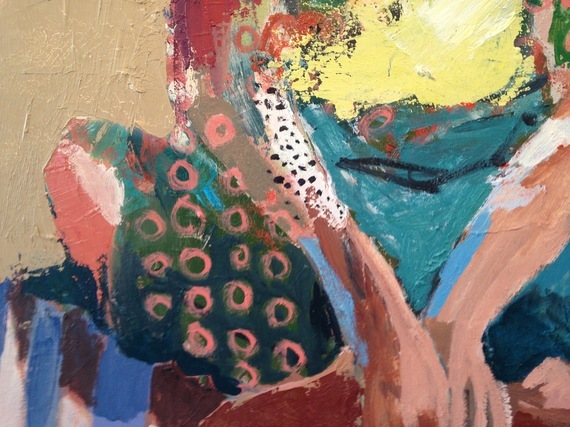 She also likes the sense of discovery that emanates from letting paint surprise her when it is able to unexpectedly conjure an emotional response or charge: in that sense her painting process is akin to that of many Abstract Expressionist painters. Christensen's paintings feel nostalgic and when I spoke to her she acknowledged that there are bits and pieces of her childhood memories coming up in some images. 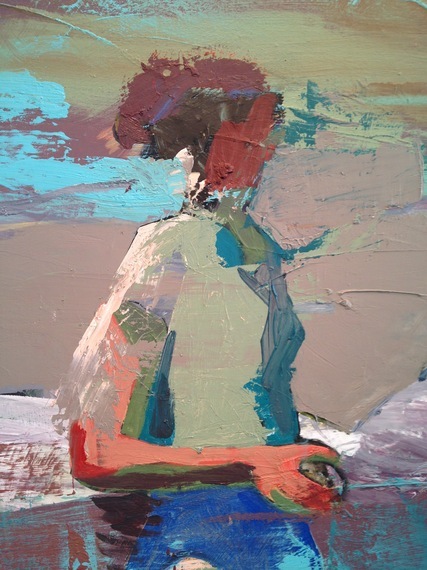 She also mentioned that, after thinking it through, that all of the female figures in her recent canvases are -- in some sense -- self-portraits. Seen as a whole, Christensen's current show feels like a series of dreams in paint, punctuated by moments of revelation, nostalgia and even catharsis. 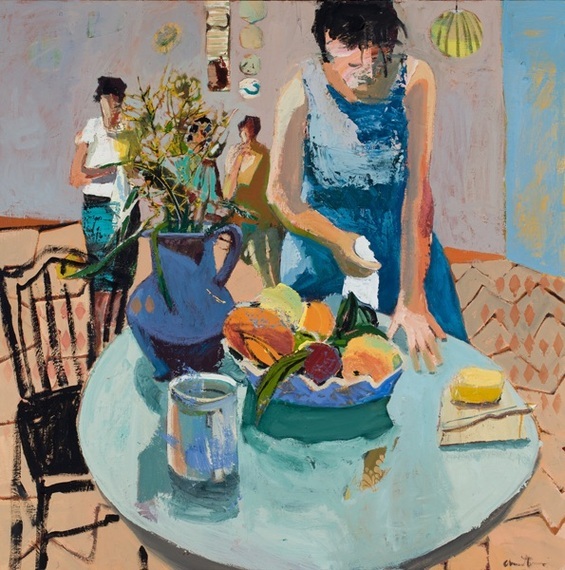 Linda Christensen, Yellow Pitcher, Oil on canvas, 54 x 54 in.